Greg Prior downed 10 cans of Coke per day for 30 days straight, all to make a point about the amount of added sugar Americans are consuming. By now you probably know that drinking too much soda is bad for your health. It can lead to expanding waistlines, put you at a greater risk of type 2 diabetes, and increase the chance of developing certain cancers, to start. Well, one man decided to drink 10 cans of Coke per day for 30 days straight, all to make a point about the amount of added sugar Americans are consuming. Prior's daily challenge was to down 10 12-ounce cans of regular or Cherry Coke, but no Diet Coke. Just from the soda alone, Prior ingested an extra 1,400 calories and 390 grams of sugar a day. He chronicled the experiment on his site, 10CokesADay.com. The Los Angeles resident, 50, started as a mostly healthy individual, weighing 168 pounds. Over the course of the month, despite maintaining his usual “sort of Paleo diet” and normal exercise routine, Prior gained 23 pounds, and saw his body fat soar from 9.4% to 15.3%. While Prior’s transformation may shock some, his facts are not entirely accurate. He claims that at least half of all Americans eat more refined sugar every day than the amount he’s drinking in all 10 Cokes—around half a pound a day, totaling 150 pounds a year. In truth, the U.S. Department of Agriculture estimated in 2012 that the number is actually just under 77 pounds, which is about 0.21 pounds a day. 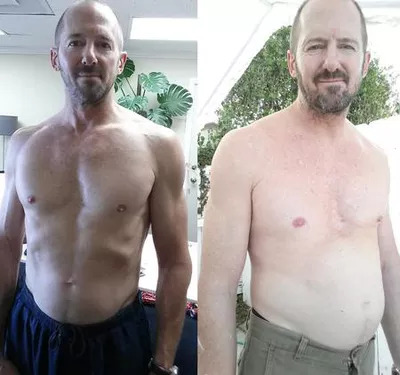 Prior’s site also seems to be a publicity vehicle for his Paleo-style cookbook, as it has links to Amazon on every page, and some have pointed out that his before-and-after photos (below) have questionable lighting differences. He is correct, however, that Americans are consuming way too much added sugar. Between 2005 and 2010, men ate an average of 335 calories from sugar per day, while women took in 239 calories' worth, according to the Centers for Disease Control and Prevention. The American Heart Association recommends limiting added sugar to 100 calories a day for women and 150 calories for men, and the 140 calories in a single 12-ounce can of Coke meets or exceeds those limits.